This is in a response to a notification that we received from Mr. XXXXXX XXXXXX (XXXXXX) that a copy of MIM?s newsletter, Under Lock & Key Issue 1, was censored by Southport Correctional Facility mailroom staff because it ?incites disobedience.? We were not notified by staff of this censorship, so we can only respond to the information provided us by Mr. XXXXXX. I am requesting a review of this decision, which reportedly applied to all pages (1-12) of the newsletter. The basis of my appeal is that it is MIM?s explicit policy to discourage prisoners from breaking any rules or laws. Not only do we promote the use of legal means of dealing with injustices, we have had a significant effect in reducing retaliatory actions among prisoners who are a part of our programs over the last couple decades. 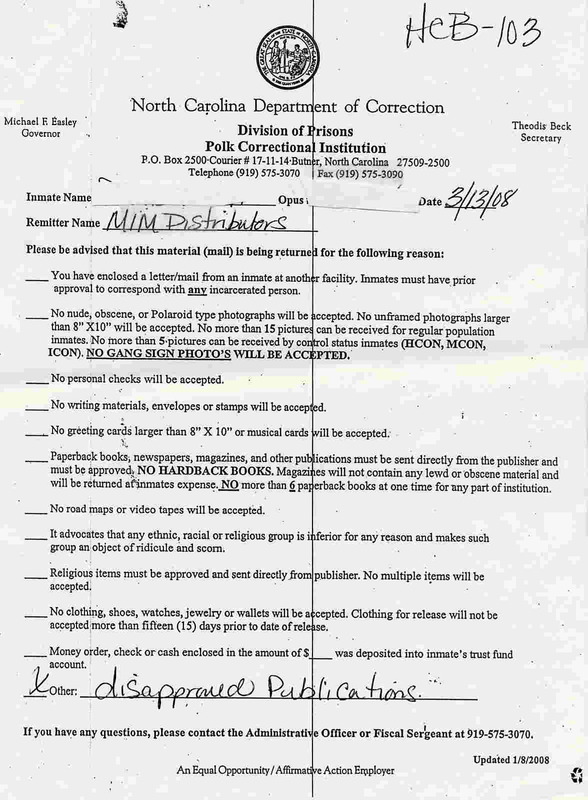 ?Note to prisoners and to mailroom staff -- MIM and its publications explicitly oppose the use of armed struggle at this time in the imperialist countries (including the united states). Our current battles in the united states are legal ones. We encourage prisoners to join these battles while explicitly discouraging them from engaging in any violence or illegal acts.? Then on page 11 a contributor writes: ?I do agree that those types of behaviors [cursing and spitting] are not only silly but stupid.? The writer goes on to encourage prisoners to use ?the pen & paper? as the only form of dealing with abuses that they face. In light of these excerpts and a review of the whole content of ULK Issue 1, I hope you will find that the claims made to justify censoring MIM were erroneous. If you disagree, please provide us with an explanation of exactly what content of this publication was deemed unacceptable so that we can work to resolve this matter. We recently received a letter from Mr. XXXXXX XXXXXX (XXXXXX), requesting that we contact you regarding a recent incident of censorship of one of our publications at Southport Correctional Facility. I have enclosed the letter that we originally sent to the Media Review Committee at Southport. Since then, Mr. XXXXXX has written to request an investigation into the fact that Southport?s Media Review Committee Chairperson, P. Sweeney, has not been notifying publishers that their mail is being censored. This letter is to affirm that we never received notice of the February 15, 2008 censorship decision made regarding the November 2007 issue of our publication Under Lock & Key. As described in the enclosed letter, we are requesting that our communications and affiliations with prisoners in the NYS DOCS be allowed per the rights granted us in the First Amendment of the U.S. Constitution. In addition, we request that if there are any further concerns that we are notified of them so that we can work to remedy them immediately, as described in New York Code Title 7 section 720.4(G)(1)(2). The February 15th, 2008 decision of the Southport Facility Media Review Committee, to reject and censor, Under Lock & Key, November 2007 No. 1, was reversed by the Central Office Media Review Committee on April 2nd, 2008, which was a huge victory in our fight against censorship. I would like to inform you that since this victory, I have been receiving material from MIM Distributors with no harassment, which is definitely great news! I?m writing you directly regarding some recent returned mail, as it seems that things have escalated to the point of unsubstantiated censorship again at SRCI. In addition, it appears that the staff there has resorted to harassment of inmates for their (assumed) political beliefs. I would like to request an administrative review on both of these decisions, and an investigation into the harassment. I?ve enclosed the two recent Mail Violation Notices, both claiming MIM Distributors is an STG. The first states that MIM Distributors is an ?Unauthorized Publisher.? Is there something we can do to notify staff of MIM?s authorized publisher status on a regular basis, like posting a list in the mailroom or something? It seems that I have had to write to you regarding this claim every six months or so. The second notice states ?STG A Call to Action.? Is staff member Moorebe claiming that MIM is a security threat group? As I?ve previously explained, MIM literature expressly discourages our readers from any activity that is illegal, violent or counterproductive in any other way. We do call people to take political action, as any political organization does. Is that now a violation of the department?s policies? I look forward to your response to this matter, and thank you for taking your time to investigate these matters for us. Shortly after my last letter I received further documentation of censorship of MIM?s mail at Red Onion State Prison from Mr. XXXXXX XXXXXX (XXXXXX). As of today, we have still not received a response to our appeal made in late November. Two of the documents were regarding grievances filed by Mr. XXXXXX regarding the censorship of a number of publications including MIM Notes and MIM Theory. The final decision made by yourself upheld the censorship for Operating Procedure 803.2 #7, 13 and 14. In my previous letter I addressed these claims in relation to MIM literature. These new documents merely recite these rules, without providing any substantiating evidence. As Mr. XXXXXX points out, it is not legal to block our mail for reasons of political disagreements or discrimination against Black or other minority group organizations. Therefore, I am reiterating our request for specific citations of the material that is alleged to have violated these procedures. The third document was in reference to the most recent incident of censorship of a letter sent from MIM to Mr. XXXXXX in October. 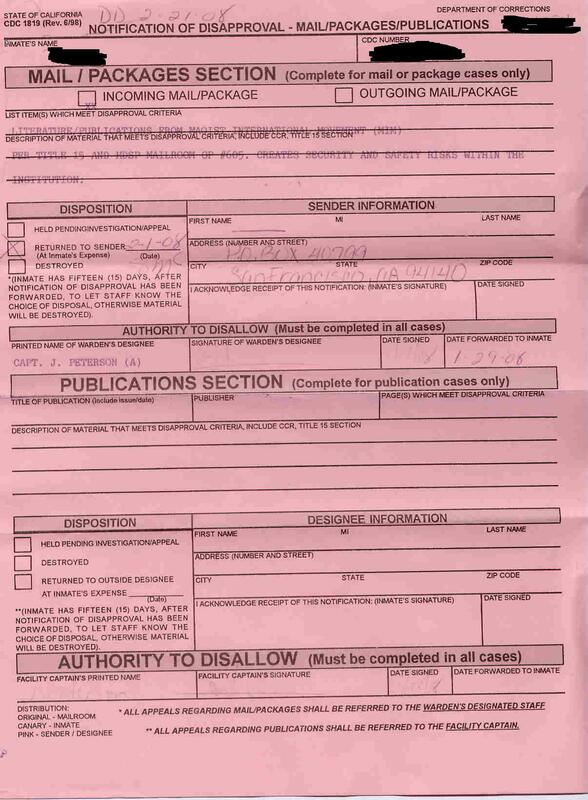 The memo from Major K. Chris claims that MIM study group material violated 803.2 #7, 13, 14 and 15. The new procedure (15) refers to publications in a language other than English or written in code. The study group material was a set of questions on the topic of a philosophy text regarding materialism and idealism. This was also sent with a copy of the letter of inquiry I had sent to your office that I was carbon copying to Mr. XXXXXX. I am at a total loss as to which portions of these materials were deemed to violate any of the rules cited. Please pass our mail along to Mr. XXXXXX or provide us with specific citations of how each item violates each operating procedure cited. In my February 10 letter to you I had inquired about an incident in which a letter to a prisoner at Red Onion State Prison from MIM Distributors was described as having ?No Approval.? I pointed out that Operating Procedure 803.2 only applies to publications, and as defined in the rule letters are not included. In your February 27th letter to MIM Distributors regarding a different letter to a different prisoner, you describe the letter as a ?magazine,? despite the fact that the letter does not fit the description of a magazine or publication given in 803.2. In your attempt to inappropriately apply the rules you have exposed your own unwillingness to allow prisoners to participate in programs aimed at education and personal reform. Is inviting a prisoner to participate in a study group ?detrimental to security? and ?the rehabilitation of inmates?? We are officially requesting an independent review of this decision to censor our mail. Also, could you please let us know who is responsible for conducting the independent review? We are quite confident that an independent review of the decision would show that not only are the rules being applied incorrectly, but that the materials in question do not pose a threat to the rehabilitation of inmates, rather they represent an important program to promote rehabilitation. Since your letter was postmarked March 6, 2008, we should still be well within the 15 calendar day requirement for our request. In your letter dated April 8, replying to my March 16 request for an administrative review, you failed to address any of my concerns once again. 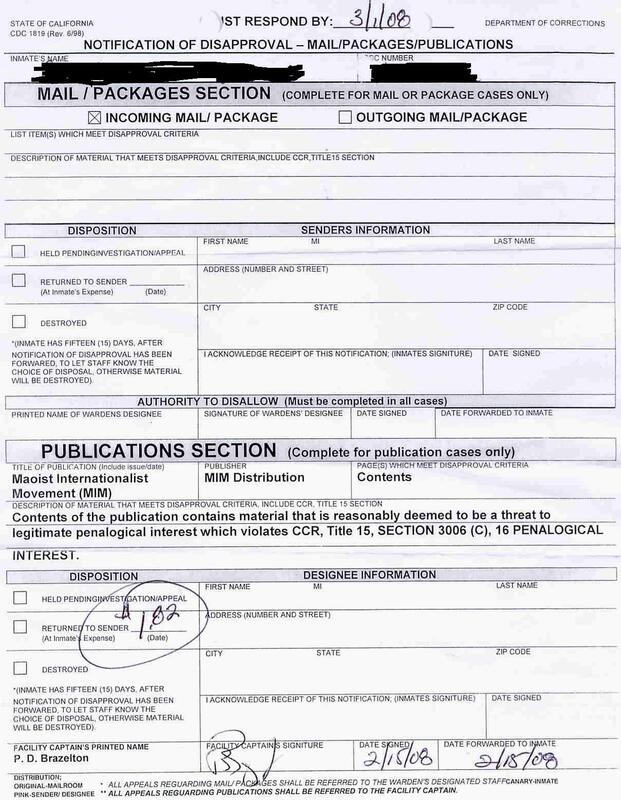 Not only are you treating a document sent to a prisoner as a magazine, but you fail to provide any response regarding the substance of you claims that the material violates any rules or posses any threats. Your letter contains no content but a restating of the rules. As I established with you late last year, we are now fully briefed on the rules and regulations as spelled out in Operating Procedure #803.2. Yet the department has failed to demonstrate how any of the materials sent by MIM Distributors violate these rules. The administrative review process was established in response to the standards of TURNER v. SAFLEY, 482 U.S. 78 (1987) which allow leeway to prison administrators so as to avoid court decisions for every instance of censorship. By failing to provide a means of dealing with these problems administratively you are preventing the decision from being effective in protecting the rights of the public to communicate with prisoners. In the most recent censorship notice that MIM Distributors has received from Mr. Benjamin Wright (see enclosed), the VADOC decided to ban a publication for an article that is critical of the department itself. This conflict of interest is also a violation of federal law. Finally, in violation of Sizemore v. Williford, 829 F.2d 608, 610 (7th Cir. 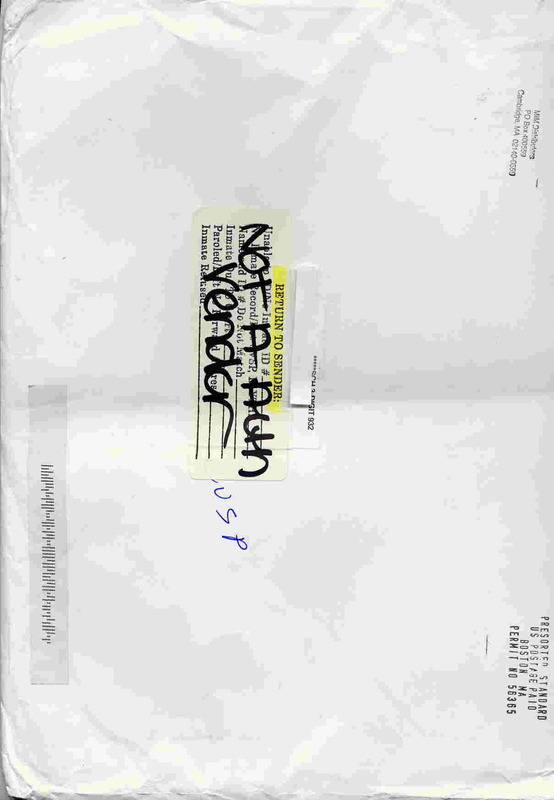 1999), the VADOC has systematically blocked and delayed mail to prisoners within Red Onion State Prison. One recent report from a prisoner documents letters that MIM Legal Department cc?ed him regarding my appeals to your office were delayed by 1 to 2 months. We intend to pursue these matters until the department can reasonably claim to be following the law in relation to mail sent by MIM Distributors and the communications of prisoners with the outside world. Our office has been notified by Mr. XXXXXX XXXXXX (XXXXXX) that he has been denied a copy of Party Bulletin Issue 6 published and distributed by the New Afrikan Maoist Party (NAMP) for the reason: “inciting disobedience.” We have not received notification of this censorship ourselves, but it is our understanding that it is required that your committee notify the party that is being censored that their mail was not delivered and why. We are requesting such notification so that we can deal with this matter effectively. The one portion of the newsletter that encourages prisoners to act is the call to New York prisoners, on page 15, to participate in an ongoing lawsuit that we are currently involved in against the NYS DOCS. It seems to me that it is a conflict of interest, and illegal for DOCS staff to be hindering our efforts to gather statements from our supporters regarding the repression that they are facing for receiving and possessing literature from NAMP. If your committee decides to uphold the decision to censor this material we do plan to add this incident as evidence of the department’s violation of its own rules in regards to its treatment of NAMP and particularly of prisoners who are supporters of NAMP. We hope that upon reconsideration you will find that there is no legitimate reason to censor Party Bulletin Issue 6 and other literature that we send to prisoners at Southport. I am writing you again regarding a new incident that just came across my desk. 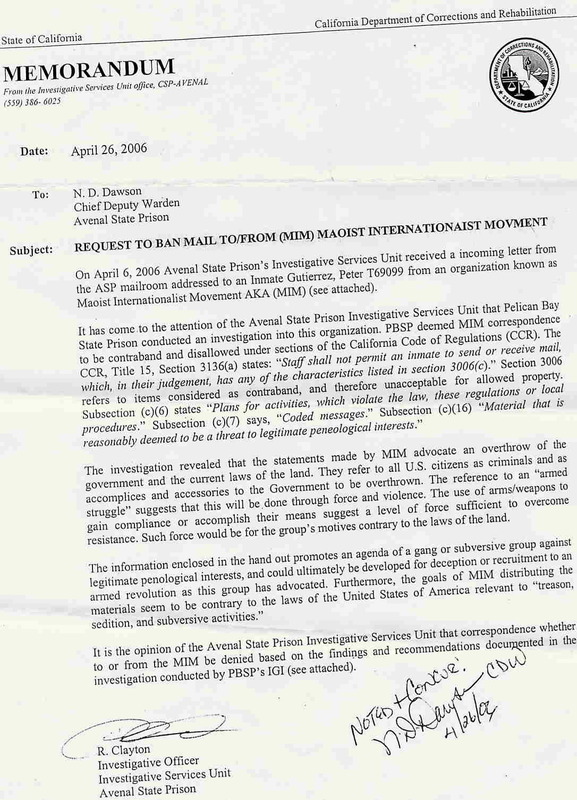 A letter that was sent by MIM Distributors to Mr. XXXXXX XXXXXX (XXXXXX) regarding the censorship problems MIM has been having at Red Onion State Prison was returned with the reason ?No Approval? (see enclosed memo). After re-reviewing Operating Procedure 803.2, which you had previously sent me, there is no indication that you need to get prior approval to send a letter to someone at Red Onion. In fact, the whole operating procedure is on the subject of ?Incoming Publications,? which are defined as ?Any written communication such as newspapers, magazines, newsletters or other periodicals, books, brochures, catalogs, or pamphlets that can be subscribed to or ordered from a legitimate mail order vendor.? Clearly, this does not include letters. Is there a separate operating procedure I should be referring to in this matter? And if letters need to be approved, how would we go about doing that? Must we write to you directly before sending each letter to someone at Red Onion? Finally, also note that Mr. XXXXXX received written approval to receive a free subscription to MIM?s newsletters on the same day that this letter was censored (see enclosed Personal Property Request Form). So if this letter is being treated as a publication by Major K. Chris, as it appears to be, then his claim of ?no approval? is unfounded. We have received your recent letter notifying us that 10 issues of our newspaper have been rejected for violating Operating Procedure 803.2. 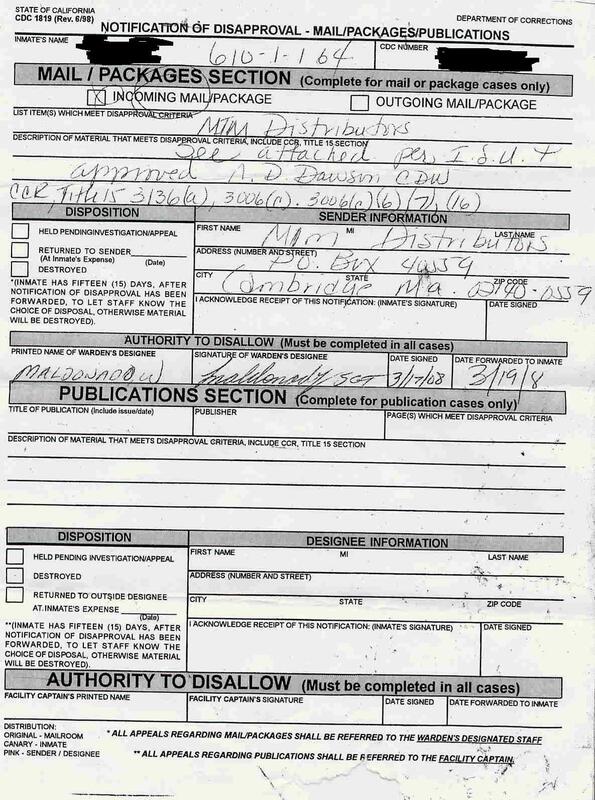 MIM Notes has been censored at Red Onion multiple times in recent months for allegedly violating Operating Procedure 803.2 and 852. In that time we have made a number of efforts to find out what these Operating Procedures are and how MIM Notes has violated them. To further these efforts, I am requesting that you send us a copy of your Operating Procedures and explain to us how MIM Notes has violated them. Also please note, that while MIM Distributors uses the Los Angeles address for their publications and distribution, or legal office is currently based out of San Francisco. By corresponding with me through the address above we can ensure more efficient communications. We look forward to receiving the above requested material so we can work to remedy this problem. We recently received the enclosed letter from Chairman Jennings of the Publication Review Committee. 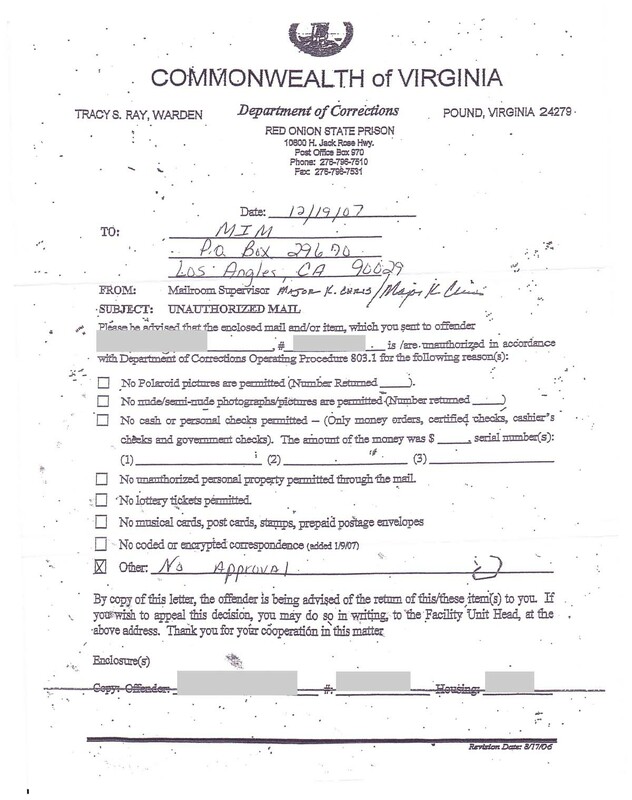 This is one of a number of incidents in recent months where MIM Notes has been censored by the Virginia Department of Corrections for allegedly violating Operating Procedure 803.2 or 852. We would like to take this opportunity to request an independent review of these decisions. It is still unclear to us the reasoning for the censorship as our past requests for explanations and copies of the Operating Procedures have not yet been met. However, the enclosed letter does state that MIM Notes ?could be detrimental to the security and good order of the institution and the rehabilitation of inmates.? As an organization MIM has put enormous energy and resources into the education and rehabilitation of prisoners throughout the country. And there is nothing in our newspaper that could be construed to support any sort of illegal or unruly activities as this would undermine our aforementioned efforts and goals. In this light, I hope you will agree that the censorship of MIM Notes has been unjustified. Also please note, that while MIM Distributors uses the Los Angeles address for their publications and distribution, our legal office is currently based out of San Francisco. By corresponding with me through the address above we can ensure more efficient communications. We have not received a response regarding our request for an independent review of the decision to censor MIM Notes made last month. If the department has already determined that our appeal merited a reversal of the decision, then this letter can be disregarded and we thank you for your time. However, since I last wrote, we have received the information we requested from W.D. Jennings, Management Lead Analyst, and would like to address the new information we have in the case that the decision to censor still stands. 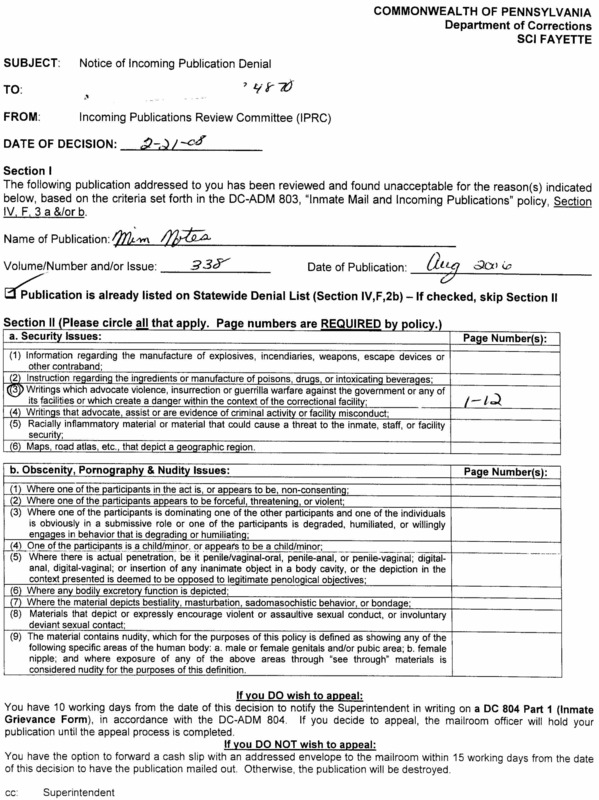 We now possess a copy of Operating Procedure 803.2 explaining the Virginia Department of Correction?s policy on incoming publications, including the criteria for disapproving publications sent to prisoners in their custody. The original letter sent to MIM Distributors by W.D. 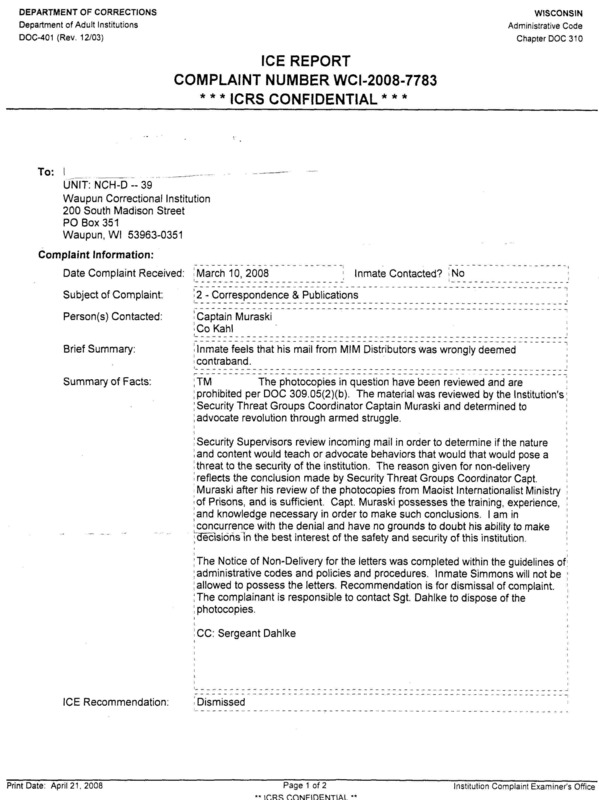 Jennings regarding the censorship of 10 issues of MIM Notes, dated October 30, 2007, does not cite specific sections of the Procedure, but did state that the newspapers ?could be detrimental to the security and good order of the institution and the rehabilitation of inmates.? I already addressed this claim in my previous letter. In the numerous rejection notices that were received by prisoners, many cited criteria #7 and #13 and most were issued by Major K. Chris, Chief of Security at Red Onion State Prison. While the page numbers cited in the memo from W.D. Jennings don?t give us the ability to address specific concerns as most pages have multiple articles on them, let me briefly address the claims made by Major Chris. While MIM Notes frequently discusses the use of violence and terrorism by various parties, it does so from a critical standpoint. For example, MIM Notes actively opposes the bombing of Iraq, the financial backing of Israel?s occupation of Palestine and even physical mistreatment of prisoners in this country. MIM Notes also regularly points out that such violence and terrorism will breed resistance. Holding such a belief is the protected right of all citizens of the United States. Nowhere does MIM Notes promote or encourage resistance that is based in violence or any sort of terrorist activities. If you believe that it does, we request that you provide specific citations where this is done. 803.2 #13 Material that depicts, describes or promotes gang signs, language, clothing, jewelry, codes or paraphernalia, gang participation or other gang-related activity or association. ?A group of individuals who: (a) possess common characteristics that distinguish them from other offenders or groups of offenders and who, as an entity, pose a threat to the safety and security of staff, the facility, other offenders or the community; (b) have a common distinctive goal, symbolism or philosophy; (c) possess identifiable skills or resources, or engage in unauthorized/illegal activities?? MIM Notes does not promote any illegal or unauthorized activities, nor does it threaten the safety or security of anyone in the facility. Similarly, MIM Notes does not promote symbols of groups that do promote such activities. Again, you would need to provide concrete examples of where such things are depicted or promoted in order for these charges to stand. MIM Distributors is very interested in remedying the problems that have led to the repeated censorship of its publications in recent months. However, to date we have been unable to come up with any actionable responses to the charges made by the Virginia DOC, as the claims appear to be unfounded. We appreciate the information provided by W.D. Jennings, but if the department determines to uphold these decisions we request specific citations of the text or content that violates the criteria cited in the publication disapproval memos. We hope to work with you to remedy these issues in an expedient manner. I have received your letter from December 19, however it does not address any of the concerns that were brought up in my previous letter dated December 10, 2007. In that letter I addressed all of the charges that have been brought against various issues of MIM Notes. Your recent letter does not provide any evidence that these issues of MIM Notes are security risks. You do state that ?the cited issues of MIM Notes contain depictions of violence and the suggested use of violent activities against individuals.? Since you fail to provide any citations to back up your assertion, let me take MIM Notes 343 as an example, as it had the greatest number of objectionable pages. The first two pages contain articles about the United States war effort against Iran and Hezbollah and the execution of Saddam Hussein. Certainly, violence is part of these stories. Is it the department?s policy to prohibit any news outlets that discuss issues of war, murder and other acts of violence? If so, I would refer you to Sizemore v. Williford, 829 F.2d 608, 610 (7th Cir. 1987), as well as Maddox v. Berge, _F.Supp.2d_, 2007 WL 420193 *9-10 (W.D. Wis. Feb. 8, 2007). In addition, Turner v. Safley, 482 U.S. 78 (1987), which set the standard for censorship of material for ?legitimate penological interests,? does not allow you to cut a prisoner off from news about the outside world. The last two pages cited as being objectionable in MIM Notes 343 are almost entirely stories of censorship in prisons, and contain no depiction of violence. I am particularly interested to hear how stories of censorship pose a threat to the security of the prisons in Virginia. And if they do, wouldn?t you be violating the legitimate penological goals of the department by arbitrarily censoring MIM Distributors and other organizations? As you know, the Fourteenth Amendment prohibits a state from denying anyone equal protection under law. And as you know, the First Amendment provides MIM Distributors with the right to freedom of the press. And as established in decisions such as Procunier v. Martinez, 416 U.S. at 415, this freedom does not end at the prison gates. Therefore I am requesting that you either allow inmates to receive the issues of MIM Notes in question, or provide legal justification for their censorship that would stand up in a court of law. I received your letter from January 16 and am disappointed that you are still unable to respond to my requests. In your letter you take issue with my statement that the VADOC is not allowed to cut a prisoner off from news about the outside world. In response you state, ? The purpose of Operating Procedure 803.2 is to ensure the safety of both staff and the inmate population by restricting published content that could be detrimental to the good order and rehabilitative efforts?? However, I did not question the intention of the policy, but rather the legality of the apparent blanket ban on MIM Notes. As you are unable to provide any evidence that the issues of MIM Notes in question are in fact detrimental to the good order and rehabilitative efforts, you should be able to understand my point. You refer me to the grievance process for publishers and imply that this procedure has been exhausted. If that is the case, then I will certainly stop wasting my time writing to you. I do understand that it is your job to uphold department decisions, but you should be aware that the laws that your department is violating are federal laws not departmental regulations. This letter is in response to two publication violation notices received by our office for literature that was sent to Mr. XXXXXX XXXXXX (XXXXXX). 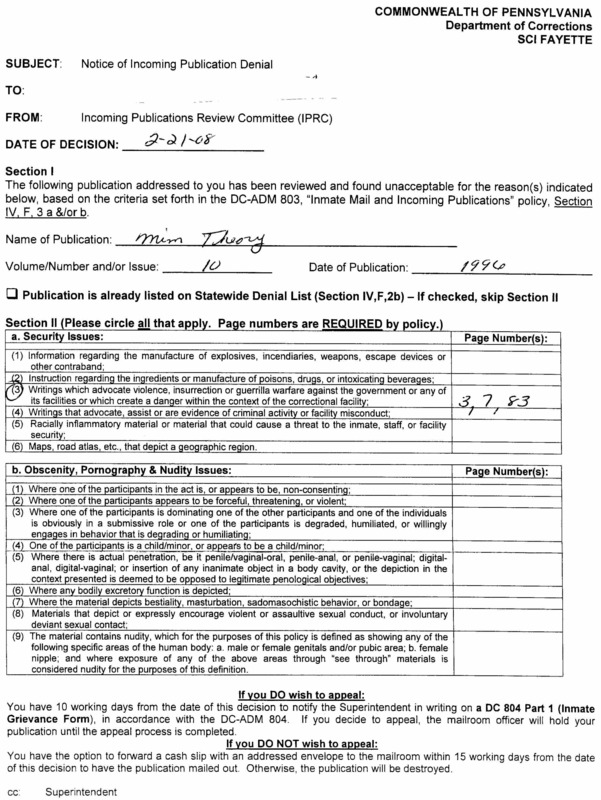 Two issues of MIM Notes were censored for allegedly violating Code 2 e and j on pages 10 and 11. Pages 10 and 11 of these two newspapers contain a section called Under Lock & Key, which both contain letters from prisoners in California regarding conditions in prisons there. The first code (2e) forbids materials that ?plans for activities in violation of other Department of Corrections administrative directives.? It is our clearly stated policy that we do not encourage our readers to break the law, and in the case of prisoners the rules at their prison. It is our belief that MIM Notes 344 does not discuss any plans that would violate Oregon DOC?s rules. If there is something in that issue of MIM Notes that does propose violating your rules, please notify us of specifically where and what rule is potentially being violated so that we can avoid this problem in the future. The second code (2j) prohibits ?inflammatory material.? Code 2j is purposefully vague in not defining the term inflamatory. It is our understanding that in this context inflammatory is taken to mean ?arousing to action or rebellion? and not the more benign definition of ?arousing passion or strong emotion.? The latter definition would restrict most anyone with something important to say from communicating with people in Oregon?s prisons. Assuming the definition of inflammatory to be ?arousing to action or rebellion,? I would still take issue with the assertion that encouraging action can be legally prohibited. Of course, it is your job to keep order within SRCI, and so your concern is to prevent disturbances among prisoners. If you feel that articles about conditions in California prisons will spark rebellion among Oregon prisoners, then I would suggest investigating the actions of your staff that might be behind such a reaction. Regardless, you cannot shoot the messenger. Stating that the truth will incite rebellion is not a legally sound way to prevent a party from expressing the truth. While I realize I do not have the ability to challenge the legitimacy of Code 2j through this avenue, I do believe that it is being used, in this case, beyond what is reasonable and legal. Clearly, political speech is protected by the First Amendment and Supreme Court decisions such as Procunier v. Martinez, and Code 2j cannot be used in violation of these laws. In August I had sent you a response to your most recent letter to Us with a copy of the third issue of Our publication the Party Bulletin for your review. You had requested a copy so that it could be reviewed and (hopefully) approved to avoid the long standing policy of the Clinton mailroom of returning, and now apparently discarding, any mail from Our organization. I never received a response from you about the Party Bulletin that was sent. Just recently it was brought to my attention that Issue 5 of the Party Bulletin was then censored at Clinton Correctional Facility in September of last year. We were never notified of this censorship, the materials were not even returned to Us. Is it now the policy of Clinton to destroy any mail from NAMP that is sent to prisoners at the facility? I am requesting a response to this inquiry explaining the justification for censorship of Our publication at Clinton. We have also begun mailing Our literature delivery confirmation in hopes that staff will be encouraged to follow the standard administrative procedures in handling mail and media review procedures. We are aware of certain individuals at Clinton who have taken it upon themselves to spearhead the campaign against prisoners who receive literature from Our organization. We hope it is within your ability to rein in these individuals so that they adhere to NYS DOCS policy as well as the United States Constitution. Please respond at your earliest convenience so that we may resolve this issue. Thank you for taking the time to respond to my previous letter and explaining why media is not always returned to the sender. However, a brief look at the handling of literature from NAMP at Clinton will make it clear where my confusion may have come from. As you?ll recall, the first time I wrote you was in response a stack of copies of one of our newsletters that were all stamped ?Contents Prohibited? and sent right back to us. When I wrote to inquire about the reasoning for this you claimed that there was no record of the newsletters arriving or being censored. In the most recent incident I wrote you about neither our office nor Mr XXXXXX XXXXXX, who we had sent our newsletter to, had received any notification of censorship, yet the newsletter was not received. Hence, my inquiry into whether it is now Clinton Correctional Facility?s policy to discard any mail from NAMP to avoid having to deal with justifying the censorship of our mail. Since it clearly is not, I would hope that this practice ends immediately. 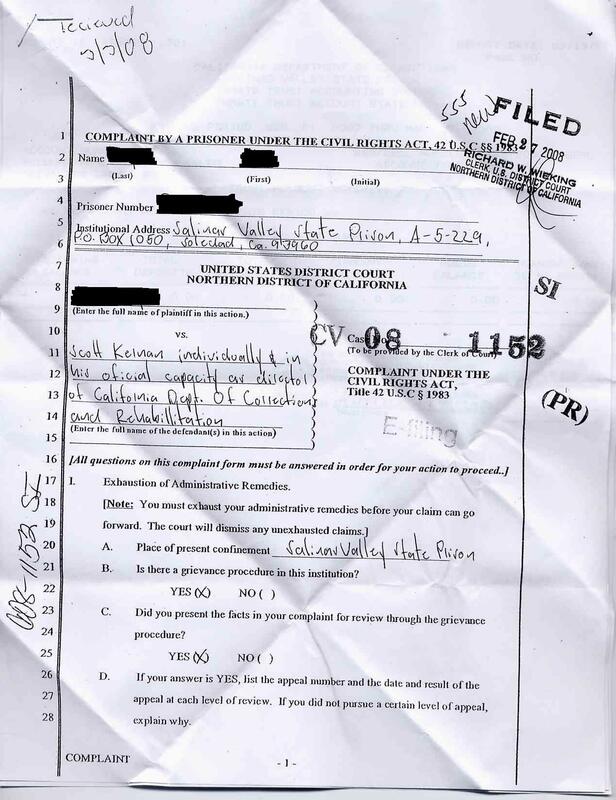 In your January 22 letter you write, ?If a portion of reviewed material is disapproved, each individual inmate is notified and given an opportunity to have the material sent home, or redacted (if under 8 pages) and sent to him? Nothing is destroyed unless it is done so at the inmate?s request.? And ?media is sent to individual inmates and would not ordinarily be returned to sender unless the inmate so requests.? Our experience has shown none of these statements to be true in practice. So you can see why we had expressed the hope in our last letter that you can get Clinton CF staff to adhere to NYS DOCS policies. Seems that would make both of our lives a bit easier. 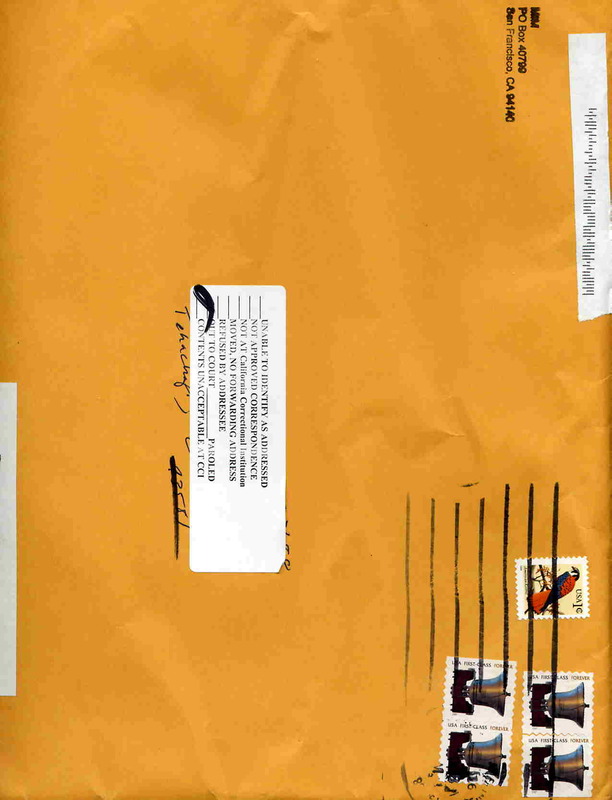 As you are aware, there is a lawsuit pending regarding the handling of our mail and prisoners in possession of our literature in the NYS DOCS, specifically Clinton Correctional Facility. We continue to document the unsubstantiated incidents of censorship that are occurring at Clinton as part of this case and hope that we can convince staff to adhere to department policies in the near future.